Promoting Big Launches – Am I Wrong? If you receive emails from me you may have noticed that, when there is a “big” launch happening, I am often curiously silent. In this blog post I would like to explain why that is, let you know what criteria I currently use to decide whether to promote a new product and ask you whether you think I am wrong. I would welcome your views on this and will ask you to comment later. First of all, let’s examine why certain marketers – even some “famous” ones – promote virtually everything that they see regardless of the quality of the product…. They figure that some people on their lists will buy anyway so why not through their link? I have seen people sending mails recently about products that don’t actually work, software that has not even had an alpha phase let alone a beta phase, training that could be taught with a couple of sentences but is spun out into 8 videos…all manner of complete rubbish. 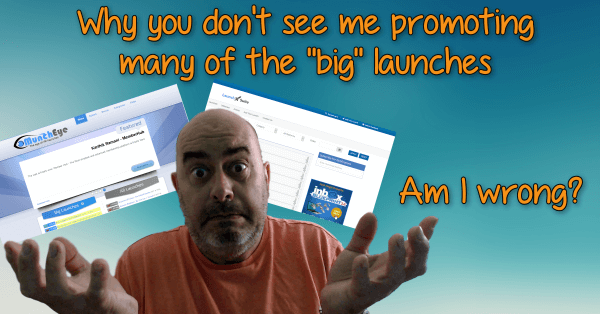 Now, I am not talking about “newbie” affiliate marketers here. Some of these people are very well known. They make a ton of money from their lists so, it does seem to work. There are other products getting a lot of promotion that are just “me too” products – one launched recently that is like a “lite” version of several good products already out there….But it’s selling shedloads because of all of the affiliate back-scratching bullshittery that goes on. It’s almost as if good products that are already out there just don’t exist…people will only promote new shiny products. But that is a whole other rant. It has to fill a genuine need or solve a particular real problem. What I mean by that is that it will either automate something that saves time and/or removes a skill factor, makes you more money, teaches you how to make more money, saves you money, or does something that, hitherto, was achievable without outsourcing to an expert. In short, by getting the product you will be genuinely empowered to make more from your online business, in one way or another. There are other things too – I won’t send to a sales page with an exit splash, for example. So, by being this picky, you don’t see me promote stuff that you get a lot of other mails about. In fact, at the time of writing, the last “big” launch product that I promoted was almost a month ago (Convertri). Should I refine my criteria for picking products to promote? Should I dump a shitload of PLR products as bonuses for everything I mail about (something else that big affiliates tell me works but I don’t tend to like doing)? Here’s the big question for ya…..Am I thinking too much about my own integrity and not enough about what my audience really wants? Let me know your opinions…Have your say…comment below and share this post so we get more viewpoints. One reason I follow you is because I have found you to be one of the very few “Honest” marketers. I follow as many of “You Guys(and Girls)” as I can, but they are not easy to find. Some of you dont agree with one another, but that’s exactly what makes you “Real People”, not fakes like so many are. If you promote a product I can rest assured that I wont have to do a lot of research just to see if you are telling the truth. If you switched that you would for sure gain more subscribers, but you also would lose most of the subscribers like myself who just want to be able to buy a good product that will help them in their business. Just be you, it’s all good! Thanks, Gary, I appreciate that. If more marketers used these criteria in their evaulation of which products to promote, we would have a much higher standard in the industry and the trust level would skyrocket. There are simply way to many “me too” products on the market. Why are most products only available for a limited time? Because their value is limited, and they only qualify as fodder for those afflicted with “shiny object syndrome”. I think “me too” products do have a place sometimes. To have your own solutions for common problems means that in AR sequences you can offer your audience your product rather than send them to someone else’s. Not always feasible but worth thinking on. Hey, before I even consider any product I go to the jv page and check out the upsells. If I’m going to step into the quicksand of “”upsell he11, then I don’t even consider it. After that, yeah I look at the person pushing the product for trustworthiness. 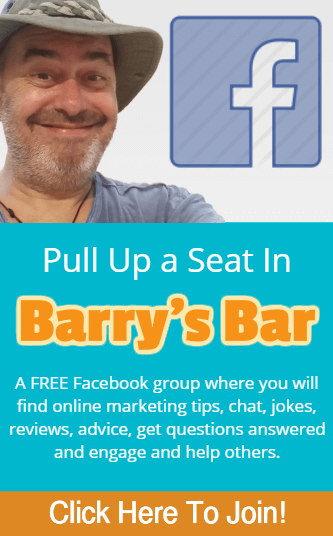 Hi Barry, No i do not think you are wrong, surely as experienced marketers it is our responsibility to educate our subscribers as to what in our opinion is a good product to purchase or not, a product that is going to add value to their business or clients business. And i completely understand what you mean as well about JV cartels and it seems to be split into two camps. Personally i do not promote anything that i have not reviewed and would not buy myself! Any push button millionaire by tomorrow products i do not even look at anymore. Completely agree Barry. I think you only need to promote something you truly believe in. I have the same ethos. If it doesn’t really help then why would my readers find it useful. I have the feeling you only need to disappoint once and you lose a subscriber for life. These days quality in what you do is what makes you stand out from the crowd. And quality is doing the right thing when nobody is watching (as the quote goes). Keep doing what is ‘right’ for you. I would rather have a few satisfied subscribers that a ‘churn and burn’ mentality. But that is just me. For me its all about trust. Some big marketers I used to follow and trust have got on this “promote anything” which is disappointing.They don’t offer me value except something to buy. I don’t buy from them anymore. I might be tempted if the bonuses they are offering are useful. I go with marketers I can trust that offer value to me as well. Like yourself Barry and Andy and some others I could name. Not many though.I guess its all about making the quick buck. You might miss out on some income Barry but I read all your emails and appreciate your comments. If you do promote a big product then I know you must think it is good. That’s the difference for me. Can I borrow your sentence here Barry..i really like it! I looked at you and consider you as same level as your companion Andy Brocklehurst and Brett Retucky and that a compliment actually …and that’s the reason why i followed you blog ..
Of course you can use that phrase. No probs, mate. Totally agree with your approach, but I will take it one step further, to the deplorable practice of ‘leaders’ in the industry fronting for others that create software that doesn’t work. Over the past couple of years, there has been one team in particular that has launched one rotten software program after another, none of which have ever worked as promised and with sky-high refund rates. I have purchased 3 different products in the last 6 months that fronted by well-known people – only to discover after purchasing that this scam artist was actually the person behind the product. And guess what? I did try the products – and they were just as rotten as the previous ones, full of bugs etc. In fact, two were simply slightly changed versions of the original product from 2 years ago. And all of the products have double digit refund rates. In any business you need to sweat blood to keep your customers happy and loyal. Unfortunately, one slip up and they leave you in Droves! There is a very fine line between success and failure and word of mouth can either be the making or breaking of any business. I too have bought into big product launches only to find that there was no substance to either the product, support or indeed the integrity of the creator or promoters. Needless to say that I no longer even glance at any offers from these people anymore and if asked for my opinion I am not very complimentary. I have subscribed to this blog and although I’ve been otherwise engaged of late, I like hearing from Barry. Keep up the good work and do what is right for you. Nobody can ask any more from you.